Hitch Hitchcock is a biplane pilot. The last thing he expects to see while flying in the sky is a woman in a ball gown and a man in a suit parachute in front of him. Even stranger to see the man firing a flare gun at the woman. Narrowly missing them, Hitch lands and searches for a trace of them. Unable to find them, he returns to the landing strip in his former home town. When he tracks Jael, she speaks a language he doesn’t understand and knows only basic english. She’s also unlike any woman he’s ever met before – a little wild and crazy. Despite having a competition to win, and the complications of past wrongs coming back to haunt him, Hitch offers to help her return to her home in the sky in exchange for her services as a wingwalker. 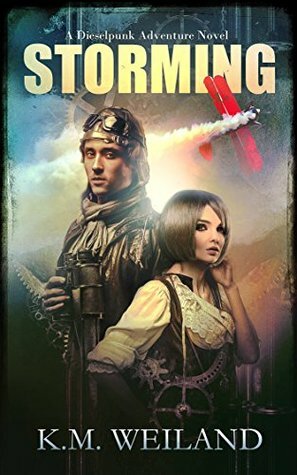 A chance crash encounter with an airship reveals that not only is Jael not crazy, the man who tried to kill her, Zlo, has taken control of the airship and a powerful weather control device. This time, Hitch can’t run from his problems. He’ll have to help Jael, and write the wrongs of the past, in order to save the family he wants to protect. Not only had his plane nearly been hit by a human being out of nowhere, she was a human being whose nowhere sure as gravy wasn’t from around here. The minute I read the blurb for Storming, I knew I wanted to read it. I wasn’t disappointed. Hitch is a great lead character. He’s flawed, and has done things that aren’t always above board, but he’s a good guy at heart, and ultimately wants to do the right thing by people, especially those he cares about. He just doesn’t always make the right choices. Jael is also a fun character, strong and stubborn, yet naive at the same time. You really wanted them to succeed. The twists and turns in the story were great, and while you could see some of them coming, there were others that you couldn’t. I found myself reading through the chapters quickly, just to find out what would happen next. A fun read.